Seven Friends of the Porter's Garden, went to Gilbert White's House and Garden and the Oates Museum in Selborne. The Rev. Gilbert White (1720 -1793) author of The Natural History of Selbourne lived here in the 18th century. He was the founding father of modern scientific recording. On display in the Library is White's original hand-written manuscript of the Natural History. The garden is well documented by White and has largely been restored to its original form. Features he describes and plants of his time are displayed in "Six Quarters", ornamental "basons", a wild flower garden and vegetable plot. There are 20 acres of garden and parkland with a selection of unusual plants for sale. It was agreed that it was a fascinating visit, and that the grounds have been developed much more since a previous visit, but kept very focused on horticulture and scientific research. A second visit was proposed to meet David Standing, Head Gardener, to explore intellectual and horticultural links. He is normally there on Mondays, Tuesdays & Fridays. They will have researched and grown many eighteenth century varieties of flowers and vegetables. Another connection to the Porter's Garden is the Captain Oates Museum and our Captain Scott statue. An interesting exhibition commemorates the Oates family and their exploits, particularly Captain Lawrence Oates, who accompanied Scott to the South Pole in 1911. Structure. Part of the garden was edged with overlapping arcs of living willow - perhaps this is not neat enough for the Porter`s Garden. Brick paths were used to contain and separate herb beds. The dried herbs hanging in the kitchen were: Tansy; Lavender; Sage; Rosemary and Poppy and there was an attractive wreath of Barley, Oats and Poppy heads. Diggers. 'Wakes Weeders' is name for their volunteer diggers. We purchased a book called Georgian Gardens by Anne Jennings, published by English Heritage, March 2005, 89 pages, which has a useful plant list in the back and enjoyed a delicious lunch in The Queens Selborne. This book explores the origins of Georgian Gardens. It looks at how they were designed and highlights the gradual move from formal 17th century designs towards a natural landscape style. Large or small, the gardens of the Georgian period were designed for relaxation and, equally importantly, they were used to demonstrate the owner's status and his understanding of taste and style. On 1 August 2005, 21 Friends of the Porter's Garden and their friends set off at 0900 from the Hard Interchange in a Vision Travel coach driven by our friendly driver Dave. Our destination was Highgrove House Gardens situated close to Tetbury in Gloucestershire. The Prince of Wales has used his 37-acre estate to promote his interest in organic farming and gardening and has made it a showcase for traditional and organic growing methods. We arrived at the nearby market town of Tetbury for lunch and by the time we set off again for our time slot for the visit it had stopped raining. Security at the gate over, we were met outside the Orchard Room built in 1998 and were then introduced to our guide, Melanie. We set of for our tour of the gardens a few minutes later. The tour took us through a series of highly individual and inspiring gardens each one reflecting the Princes interests and enthusiasms. Vistas play a large part in the overall plan. It is hard to pick out special favourites as each one brought something new and exciting to consider. We were unfortunately too late for the wild flower meadow and the tulip walk planted with thousands of tulips in shades of purple and red. 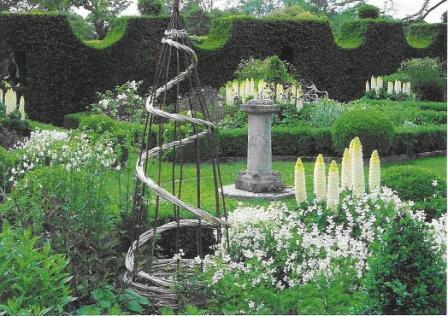 However, I particularly liked the Terrace Garden, the Thyme Walk and the Sundial Garden illustrated below. The group also enjoyed the Woodland Garden and "Stumpery" and agreed the Southern Hemisphere Garden was coolly beautiful. The garden we thought we would like to take home was the Walled Garden even though it would be a lot of work. A wonderful creation of vegetables, flowers and fruit trees, of about an acre, patriotically designed in the form of four beds divided up as the crosses of St George and St Andrew by box hedges. At the centre is an Italian fountain with an artistic covering of moss. At the end of the tour is the Carpet Garden, inspired by a Turkish carpet with which the Prince won a silver medal at Chelsea Flower Show in 2001. It was transferred back to Highgrove and installed in a new walled garden. We were then treated to tea and biscuits (Duchy Originals of course) in the Orchard Room with time for a visit to the shop afterwards. Having thanked our guide for her illuminating tour we set of for home after a really enjoyable and motivating visit. 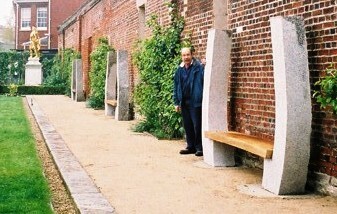 Sculptor Roger Stephens installed three sculptured seats in the Porter's Garden on 24th May 2005. Each seat has the shape of the cross section of the hull of one of the three historic ships, Mary Rose, HMS Victory and HMS Warrior 1860. Roger designed the seats. He made them from 6 granite blocks, of total weight 10 tons, that had formed a cart track in Portsmouth dockyard. Roger works from a studio near Salisbury. From the outset I sought inspiration from artefacts in the dockyard, the museums and the ships. I also felt that the seats had to have relevance to Portsmouth's proud naval and dockyard traditions. I wanted something that represented naval history and dockyard skills, would be recognisable and yet have a sculptural quality. The main attractions of the Historic Dockyard are the three ships, Mary Rose, HMS Victory and HMS Warrior 1860, all of which have an inherent beauty in their construction. Having arrived at this conclusion I decided that the main unifying element was the hull. I have therefore used cross sections from each of the three ships as a basis for the designs. The three designs approximate the sections in both size and dimensions. As the size of the available blocks of granite constrains the size of the uprights and the ships vary considerably in scale, the three seats are designed in different sizes. This will also allow them to fit into the available spaces. I have designed the seats so that they are recognisable primarily as ship's hulls and secondly as coming from the three ships on display. The light grey granite will contrast well with the warm red of the dockyard wall, making them stand out and invite interest, speculation and most importantly, use. The horizontal seats are slightly curved to give the impression of a deck; this will also allow rainwater run off. Providing the sculptured seating is part of The Porter's Garden project supported by the Onyx Environmental Trust and Hampshire Gardens Trust. Dr Colin White opening the Nelson Border on Monday 21 March 2005 to commemorate the two-hundredth anniversary of the Battle of Trafalgar and the death of Lord Nelson in 1805 with Dr Ann Coats. On Monday 21 March at noon the Friends of the Porter's Garden in Portsmouth Historic Dockyard and their guests from Portsmouth Historic Dockyard, the local community and the City Council will launch Trafalgar 200 (on the same day and time that the battle of Trafalgar began in October 1805). Dr Colin White will open the chequered yellow and black Nelson Border, which represents Admiral Nelson's particular style of painting the gun port lids of his ships. Portsmouth City Council, which is coordinating SeaBritain events in Portsmouth throughout 2005, gave the Friends of the Porter's Garden £200 which paid for the 600 young violas. The young plants arrived from Kernock Nursery in Cornwall before Christmas and were over wintered at Greenfingers Horticultural Centre at St James's Hospital. They were potted on by the Friends of the Porter's Garden, and planted out at the beginning of March. Dr Colin White, Deputy Director of Portsmouth Royal Naval Museum and Director of the Nelson Letters Project, whose latest book, Nelson - the new letters, will be published in April 2005, is a most fitting person to open this border, which will edge the Porter's Garden in College Road. Colin will be aided by a surprise guest. Following Admiral Horatio Nelson's orders, ships joining his fleet off Cadiz in October 1805 were ordered to paint their gun ports black to effect the 'Nelson chequer'. Their black mast hoops were also painted out with yellow ochre to provide easier identity of English ships in the forthcoming battle. Nelson's colours will be represented by the yellow and black violas, selected to withstand spring conditions in the dockyard and flower for most of the summer. They will then be cut back to produce a second flush for 21 October 2005, the 200th anniversary of the Battle of Trafalgar, giving visitors to Portsmouth Historic Dockyard the maximum view of this border. All are welcome on Monday 21 March 2005 at noon. This recreated eighteenth century garden is free and open every day. All money raised by the volunteers is spent on plants and soil improvers for the garden. See www.hants.org.uk/portersgarden for pictures of this award-winning garden. Dr Colin White, Director, Trafalgar 200 at the National Maritime Museum at Greenwich will open the Nelson Border on Monday 21 March 2005 at 12 noon (the time when the battle of Trafalgar began). Could anyone who can be there arrive at 11.30 please? The Friends of the Porter's Garden Dockyard are celebrating £1,000 from Hampshire Gardens Trust towards three seats representing Mary Rose, Victory, and Warrior. 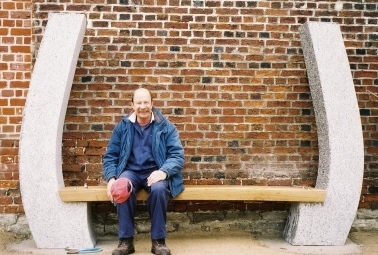 Sculptor-stonemason Roger Stephens will fashion recycled granite blocks into the three hull profiles, which will be installed in the Spring, just two years after the seating appeal began. All are welcome to a Midsummer Eighteenth Century Soiree on Sunday 26 June 2005. Enjoy refreshments and music in a beautiful garden for £5.00. Details later. On 2 February 2005, five Friends of the Porter's Garden paid a visit to Brandy Mount House in Alresford to see one of the National Collection of Snowdrops. We learnt that there are five main groups of the genus Galanthus, namely Nivalis, Reginae-olgae, Plicatus, Glaucaefolii and Virdifolii. Snowdrops although not native to Britain grow well on the rich calcareous soil in the area and enjoy the mainly open aspect of the garden. There are extensive plantings around the pond and beneath trees and also under smaller shrubs and herbaceous plants. Some species prefer hotter, sunnier conditions but many grow best in dappled shade. Some very successful combinations of flowers we saw were snowdrops and cyclamen, snowdrops and hellebore and snowdrops and winter aconite. There were also many sweet smelling daphnes, both pink and white, in the garden and interesting and unusual plants in the greenhouses. There is also a raised bed potager. We bought a few Galanthus reginae-olgae, an autumn flowering species, for the Porter's Garden. After our very enjoyable visit we had delicious lunch in The Globe at the bottom of The Soke, Broad Street with a fine view of the lake. 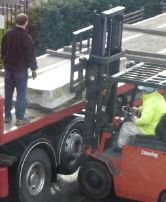 In the garden on 5 January 2005, the granite blocks for the sculptured seats being loaded onto transport to Cornwall for cutting to shape.